There are people out there that enjoy working with their hands. Labor jobs have gotten a bad name over the years. The workers are thought of as unskilled and usually get paid low wages. That perceptions is about to change. Skilled labor jobs require technical training and plenty of hands on work. There are some skilled labor jobs that pay very well. These are the top 5 best paying skilled labor jobs. All they require is some technical training and on the job experience. A person also has to be willing to work with their hands and enjoy it. Additional information about these jobs can be found at adept. 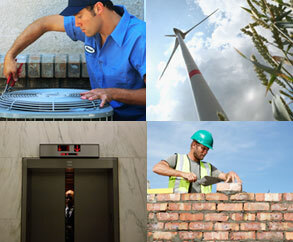 A wind turbine technician is responsible for the repair and general upkeep of the internal workings of a wind turbine. They are responsible for everything from changing light bulbs to repairing circuit boards. This field is new so there are plenty of jobs. According to experts from the American Wind Energy Association this field is expected to grow by 39 percent over the next couple of years. To do this job a person has to work with their hands and they cannot be afraid of heights. The average salary for wind turbine technicians is around $67,000 a year. Technicians that have eight years or more experience in the field make $84,000 annually. When there is a problem with the plumbing system a person may find themselves at the mercy of a plumber. There are many things that a plumber must know how to do. They need to be able to fix toilets, install waster and disposal systems in both residential and commercial properties , install gas systems, and work with a variety of different materials. Those are just some of the responsibilities of this job. A plumber has to know how to read a blue print and how to work with different tools. Plumbers also have to stay up to date with the latest water and waste systems as well as energy efficient appliances. A plumber will need to take a certification course but there is some information they can learn on the job. The average plumber makes $57,000 a year. Skilled and experienced plumbers can make as much as $97,000. An HVAC tech works with heating and cooling systems, refrigeration systems, and needs to be able to install these systems in both residential and commercial buildings. They will also help with the transportation of items that need temperature control such as medicines and foods. They need to make sure the trucks transporting these goods are in proper working order. They also need to learn how to repair heating and cooling systems. A person can go through a certification program at a vocational school to learn this trade. A person in this field needs to understand chemistry, physics, and how to read a blue print. The average HVAC tech makes $51,000 a year. These mechanics are responsible for assembling, installing, maintaining, replacing, and the general maintenance of elevators, escalators, chairlifts, moving walkways, and dumbwaiters. This job has a great deal of responsibility and the mechanic has to make sure everything is done properly to keep people safe. These employees are part of the Union of Elevator Constructors and must undergo on the job training as well as specific educational requirements. There is a need for experienced and skilled technicians in this field. The average elevator mechanic makes $50,000 a year. Those with five years or more experience in this field can make as much as $96,000 annually. This is a great job for those that like to work with their hands and to be creative at the same time. These inspectors can do everything from figuring out how to fix potholes to making sure that buildings are safe for people to enter. They will need to be able to examine a number of different structures. These structures include buildings, highways, sewer and water systems, bridges, and other structures. The inspector has to make sure that everything is up to code, are following all ordinances, follow zoning regulations, and any local or state regulations that are designed for safety. Many of these inspectors are government workers. Building inspectors can also be self employed and set their own schedule and hours. The average salary for a building inspector is $48,000. This is great for people that like to do something different each day at work and want to get out into the community. These are some of the best paying skilled labor jobs. More information on these jobs can be found at adept. These jobs are currently expanding. A person that likes to work with their hands can make a good living doing these jobs and they will get to be hands on everyday.